Dupondius, struck 72 AD in Lugdunum. Obv. : IMP CAESAR VESPASIAN AVG COS IIII, Vespasianus head, rad., r., with globe. Rev. : FORTVNAE REDVCI / S - C, Fortuna stg. l., r. holding rudder on globe, l. cornucopiae. Obv. : IMP CAESAR VESPASIAN AVG COS IIII, Vespasianus head, rad., l., with globe. Rev. : PAX AVG / S C (ex. ), Pax stg. l., r. holding patera over altar, l. branch and caduceus. Rev. : ROMA / S - C, Roma seated l. on cuirass, r. holding wreath, l. parazonium; behind, shields. Rev. : ROMA (ex.) / S - C, Roma seated l. on cuirass, r. holding wreath, l. parazonium; behind, shields. Rev. : SECVRITAS AVGVSTI / S C (ex. ), Securitas seated r., head resting on raised l. arm, r. holding sceptre; to r., altar and torch. As, struck 72 AD in Lugdunum. Obv. 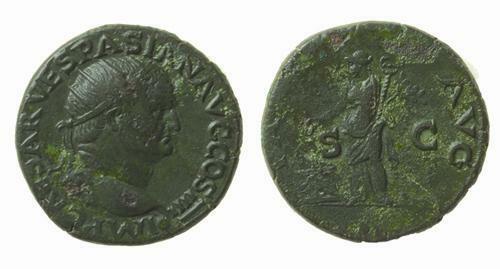 : IMP CAESAR VESPASIAN AVG COS IIII, Vespasianus head, laur., r., with globe. Rev. : AEQVITAS AVGVSTI / S - C, Aequitas stg. l., r. holding scales, l. rod. Rev. : PROVIDENT (ex.) / S - C, altar-enclosure with double panelled door; uncertain ornaments on top. Rev. : PROVIDENT (ex.) / S - C, garlanded altar-enclosure with double panelled door; uncertain ornaments on top. Rev. : VICTORIA AVGVSTI / S - C, Victory adv. l., r. holding wreath, l. palm.